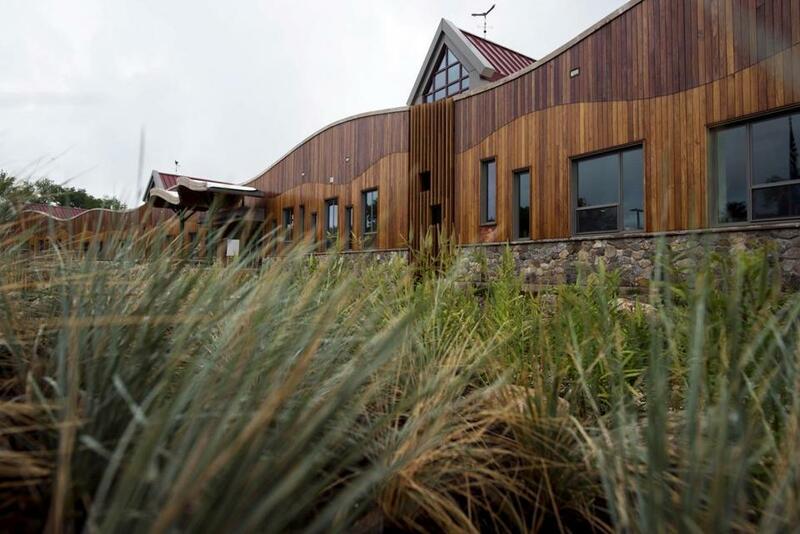 The new Sandy Hook Elementary School in Newtown, Conn. In the days following the school massacre in Parkland, Fla., the questions came fast and furiously: What can be done to fortify school buildings around the country? And would such efforts work? Some believe that bolstering the physical security of schools is a key step in deterring mass shooters. That’s led the business of securing schools to grow, by some estimates, into a multi-billion industry. But slowing down or even stopping a shooter isn’t as simple as adding locks or bullet-proof glass. School-based mass shootings remain relatively rare, academics insist, so there is scant evidence that traditional methods of “hardening” school buildings, such as metal detectors and cameras, are effective at preventing attacks. Even the best recommendations for improving building security can probably do only so much to thwart a gunman on a rampage, they add. Experts in construction, gun violence, and school safety say that with each mass shooting, they are learning more about what measures are most effective and hope that body of research will guide them in the years to come. In a comprehensive analysis on the subject,the RAND Corporation led a 2016 study backed by the US Department of Justice that looked at a wide range of steps schools have taken to try to bolster security, including locks and alarms, barricades, video surveillance, and social media monitoring. “The field is in desperate need of more evidence on what works,” her report concluded. Better research may be on the horizon. In 2014, the Justice Department launched the Comprehensive School Safety Initiative, with a $75 million congressional appropriation. In the meantime, many schools rely on two reports on security measures — one from the Department of Homeland Security, the other from the National Institute of Building Sciences — that outline what are considered best practices for securing schools. One of the main recommendations in those guides is to establish secure entries. The percentage of public schools reporting that they controlled access to their buildings — such as with locks or screened admittance — increased from 75 percent in the 1999-2000 academic year to 93 percent in 2013-14, figures tracked by the federal Education Department show. But even those measures, while helpful in securing schools in the day to day, may do little to stop or slow down a determined mass shooter. “Once you have a motivated offender who’s willing to shoot up a school and maybe kill themselves or lose their own life, it’s extremely difficult to defend against that,” said Eric Madfis, associate professor and degree chair of criminal justice at the University of Washington Tacoma. It’s also important that schools not be locked so tight that students can’t quickly evacuate in the event of any emergency, be it a shooter or a fire. Metal detectors and cameras, too, can seem like smart preventive measures at first blush. But security industry executives say they can be costly to buy and keep properly staffed, and they’re unwelcoming to students. Metal detectors can create lines and delay students from getting to class, while research has failed to show clear evidence that they reduce violent behavior among students. And experts said they would not expect a mass shooter to be deterred or slowed by metal detectors. That may explain why the percentage of schools that reported using random metal detector checks decreased from 7 percent in 1999–2000 to 4 percent in 2013–14, federal statistics show. Cameras, too, raise doubts. To be effective in a fast-moving active shooter situation, they must be constantly monitored, so a security officer or police personnel can react quickly. “They’re only effective if someone is sitting there staring at a computer screen,” said Minnich, of the American Institute of Architects. Schools have to balance desires for physical protection against such relatively rare events with other serious considerations, including cost and maintaining an environment that doesn’t frighten students or detract from their ability to learn. One building many experts touted as a model for incorporating the most highly recommended security elements is the new Sandy Hook Elementary School in Newtown, Conn. The old building was torn down after the December 2012 massacre at the school and local officials there took pains to study available research and seek expert guidance in designing a new building that helped the community heal and feel secure but not in a way that was overwhelming. The school features one main, closely monitored entrance where students and visitors can get into the building, but only with permission. There’s strategic use of bullet-resistant glass and other materials on certain windows. Classroom doors also lock from the inside, while numbers on the outside of the building indicate to first responders where certain rooms are, and landscaping elements are designed to protect the building. The building’s architect was hesitant to go into many specifics, citing safety concerns. Few of the new measures are noticeable. They are cleverly hidden so the building isn’t uninviting or frightening to students, said Bob Mitchell, architect and chairman of Newtown’s Public Building & Site Commission, which helped oversee that project. He said there can be a fine line. Some schools in other parts of the country have gone too far, installing high visibility security measures. He encouraged schools to be creative, judicious, and thoughtful in how to shore up their buildings. Even as the new Sandy Hook Elementary School is considered a model for school safety, it’s still in some ways a work in progress. Mitchell said that fine-tuning continues as officials pay close attention to evolving best practices and lessons learned from other school shootings.